I have spent the past 25 plus years as a fine artist working primarily in Watercolors. My work has been shown in top Galleries in the US and abroad and in national shows such as the National Watercolor Society, The American Watercolor Society, Rocky Mountain Watercolor Society and numerous others. I continue to sell my art as signed and numbered limited edition prints and offer cards depicting my art work, as well as original watercolors. Fifteen Years ago God gave me a vision of sharing His incredible love and grace to others. I began sharing my testimony about my ‘Healing Journey’ and about the Incredible God I know. Introducing Him to others at women’s and men’s groups, gatherings, churches, conferences and events. I have been honored to be the Keynote speaker at events such as the Kick off for 40 days for Life and to an audience of over 600 at a Gala for a Pregnancy Care Center. I have the opportunity to share with others and am available for speaking engagements to encourage others about the love and healing of our God. Spending time in the Word and studying my ‘best friend’ – Jesus Christ, I began to believe all He said that was available to us, I was miraculously healed of Breast Cancer, and my husband of a heart condition. 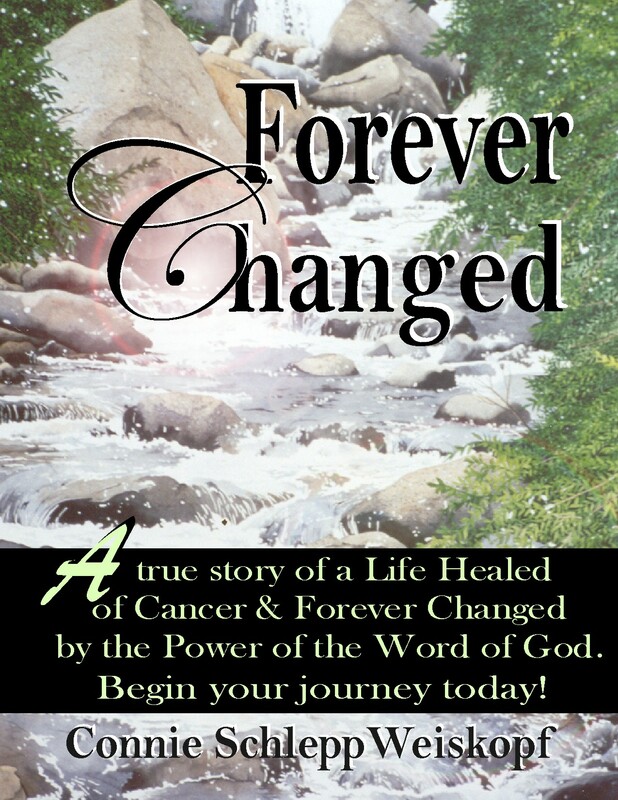 My book about my Healing Journey titled “FOREVER CHANGED” is available on Amazon and has changed the lives on many, bringing a greater understanding of God’s Healing. My passion is to share with as many as I can about God’s Power and Authority and what you have inherited as a result of the sacrifice of His Son. My hope is that others will be able to grasp the love of God and receive their healing. good morning connie. i saw you on andrew’s broadcast thiss morning. you have inspired me; i am not an educated woman or have i acomplished anything of any real visible value. i am however on a journey of a different sort. i am trying to become of survivor of demostic violence. my offender is a professing christian who church hops. my husband. it is a long story but it has become very obvious to me that God has called me to help others. i am just beginning my mission and am scared. please pray for me. and thank you for your faithfulness. Thank you for sharing with me Jacquiline. I pray your journey is short to complete healing and restoration. You ARE A SURVIVOR! No longer let what this man did to you steal one more second of the awesome life God has for you. KNOWING JESUS, and accepting HIS finshed work helps to look past your husbands abuse to this incredible Jesus. Hurting people hurt people. I think I heard that from Joyce Meyers and wrote it in my Bible years ago. I may not agree with everything she says but I did like this little sentence. It helped me to look at others through the eyes of Jesus. I no longer held that unforgivness and no longer could be angry with them. At their actions – Yes. But not at them. It did not however mean they needed to continue to be a part of my life. I am so glad you are now reaching out and helping others. This man who hurt you was hurting in some way… but it never gave him the right to hurt you! There is power in a story when it begins and ends with JESUS! ~ WOOOO HOOOO as I often say. and…God is so awesome. Keep looking to HIM and sharing Truth! ~ In His grace and love and mine. Good morning Connie.I saw you this morning on the Andrew Womack program. I enjoyed what you said about abortion.Thank you for sharing your experience. May our Heavenly Father continues to bless you in every area of your life. My name is Crystal mother of 2 small kids from Portland Or and I saw your story on Andrew Wommack Broadcasts. thank you for contacting me through my blog. Someone hacked my website again and or it is down again. So happy to pray for you. I want you to know that God has already healed you. I want you to start speaking to the ‘mountain’ the problem. I want you to start taking the power and authority that God has Given you as a believer to move this mountain to tell it to leave. Blessings to you Crystal and know you have all the love, grace, healing, provision and power to move this mountain.